One of my 2011 Genealogy Resolutions is the scan all of the slides in my grandma's house. Cheryl at the Twice Upon a Time blog asked me how I planned to scan the photos. So I will try to explain it to everyone. This fall I purchased a VuPoint Film and Slide Converter (Amazon affiliate link). I purchased mine from Woot! as one of their daily deals (But who knows when or if it will ever come up again. Last week I pulled out a tray of 30 slides to use as an example. 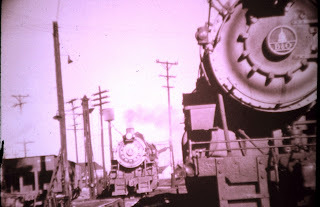 It was labeled "RR Engines and River" and the photos were most likely taken by my grandfather, who loved both. I placed the slides into the tray and pushed them through the VuPoint Converter. I used the software that came with the device to save the slides to my computer as TIF files. Once you get the hang of it, it doesn't take long to scan each slide. Below is one of the images (click on it to make it larger). One of the hardest parts is getting the slide into the tray in the right orientation. But if I get it wrong, I just do some photo editing. You also have to wiggle the tray around in the converter in order to get the entire image in the viewer. It isn't difficult, but requires a little patience and a fine touch. You can always edit out any black stripes on the sides later. My grandfather also made his own slides and the two cardboard pieces don't always line up straight. This problems makes it difficult to open the slide tray sometimes. Extra trays are available and I may order more soon. After I scanned an entire tray of slides, I made them into a slide show using Windows Live Movie Maker (a free program). I used one of the transitions that looked like slides changing on a projector. I also used a visual effect to make the images black and white in order to get rid of the purple tinge on this set of slides. This was not the best set of slides to use as an example. I tested out the converter using the set of slides from my grandparents' honeymoon in 1949. They were in color and looked great after digitizing. If anyone has any more questions about my slide scanning, let me know. I'll have a better grasp of it as I start to scan the 100 slide trays and continue to refine my process. Disclosure: No one paid me for this post, but I did use my Amazon affiliate links. I won't know if you bought anything, but I will get a small percentage of your purchase price at no extra charge to you.